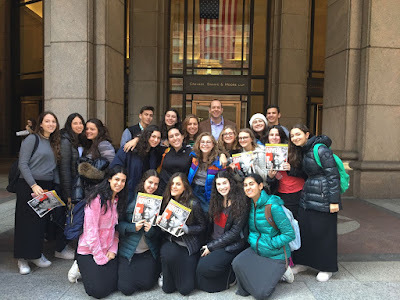 Today, the staff of the Yeshivah of Flatbush Joel Braverman High School newspaper, The Phoenix, and the students of Mr. Hofstetter's Journalism elective took a trip to the offices of ADWEEK magazine. There, we met head editor Lisa Granatstein, along with five other journalists on the magazine's staff. They each spoke about how they embarked upon a career in journalism. They offered advice on internships and how to come by them, and they also told us stories about good and bad experiences they've had working with people in high positions like CEOs and celebrities. They told us that things may not always go as planned but you find a way to work with what you have. They then gave the floor to us and we asked many questions, like their favorite parts of the job and how they put their own style of writing into their articles. We all learned a lot about journalism through the staff's insight.